The Tripp Lite U360-004-AL silver 4-port USB 3.0 portable super speed mini hub is suitable for use with USB 3.0 and is backward compatible with USB 2.0 as well as USB 1.1 devices. 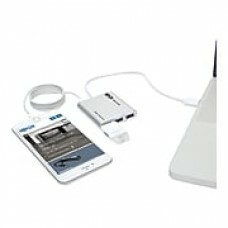 It offers data transfer rate of 5 Gbps and easily fits into your backpack, briefcase as well as laptop bag. This bus-powered hub featuring lightweight aluminum construction has USB 3.0 type-A male connector on first end and USB 3.0 type-A female connector on second end.